In the Main Menu, click eServices, eReminder. eReminders is an eService that sends automated text message and/or email reminders about upcoming appointments. They are intended to be sent a short time before an appointment so patients don't forget to come. For a list of supported browsers, see Computer Requirements. Create eReminder Rules and select other options. 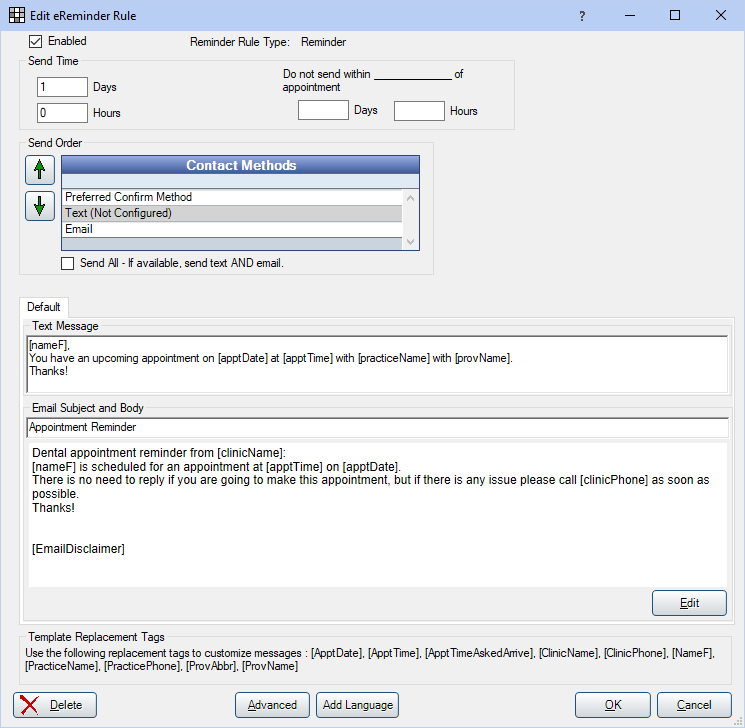 Rules determine when and how an eReminder is sent, and the reminder message. eReminder rules determine when reminders are sent, the delivery method, and the message text. To send eReminders, the eConnector must already be installed. See eConnector for easy installation steps. When there are multiple clinics, you can create default rules that are used by all or some clinics, or different rules for each clinic. Automation can also be turned on/off per clinic. Click Add Reminder or double click an existing rule to edit. Enable: By default this is checked, meaning the reminder rule is turned on and active. Uncheck to disable the reminder. Days / Hours: Set how far in advance of the appointment, in hours or days, the eReminder should be sent. Entering 0 for both days and hours will disable the rule without deleting it. Do not send within ____ of appointment: Control whether or not messages are sent for short notice appointments (e.g. same day appointments). When values are entered for Days / Hours, eReminders will not be sent when the upcoming appointment time falls within the time period. If both Days and Hours are blank, reminders may be sent up to the appointment time. Note: The automated eServices schedule also affects send time. See eServices Misc. If a reminder is scheduled to be sent before the automated eServices start time, the Do not send value is ignored. Send Order: Select how the eReminders will be sent. Preferred Confirm Method: Use the patient's preferred confirmation method to send the message. If Work Phone is selected the program will move to the next send method (Text or Email). See Edit Patient Information. To send text messages, sign up for Integrated Texting Feature. To send emails, set up Email. Customize the eReminder text and email message. Email Subject and Body: The first text box is for the subject line. The second text box is for the body of the emails. [ApptTimeAskedArrive]: The time the patient is asked to arrive (Time Ask to Arrive). [ClinicName]: The name of the clinic (Clinic). [PracticeName]: The practice name (Practice Setup). Note: Click Edit to open the HTML Email editor and further customize the invite email. Note: When a new appointments is created and the send time for some rules have already passed, the rule closest to the appointment date/time will be used. Example: There are two rules: 7 day and 3 day. A new appointment is created 2 days from now. The 3 day rule will be used since it is closest. When one or more appointments on the same day share a common patient email address and/or wireless phone number, the associated eReminders will be grouped together into one long text message or email. On the Edit eReminder Rule window, click Advanced. Click OK to save and return to the Edit eReminder Rule window. Note: Clicking Cancel to close the window will also close the Edit eReminder Rule window without saving any settings. 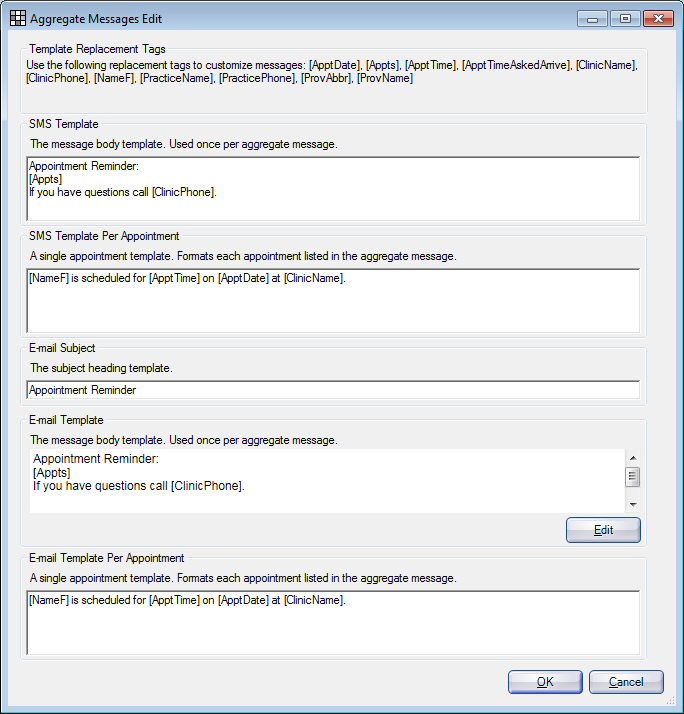 SMS Template: The text and template replacement tags to use for the general aggregated text message. The tag [Appts] will represent each appointment and is required. If you have questions call [ClinicPhone]. Email Template: The text and template replacement tags to use for the general aggregated email message. The tag [Appts] will represent each appointment and is required. If you have questions call 555-555-5555. This is a general option that applies to both eReminders and eConfirmations when the clinic on an appointment is set to none. When rules, confirmation status, and automation options are set up correctly, activate the service to begin sending eReminders. On the Automated eReminders and eConfirmations tab, click Activate eReminders. The button label will toggle to Deactivate eReminders. Note: To stop all eReminders from sending, click Deactivate eReminders. How can I prevent an eReminder being sent for a specific appointment/patient? On the Edit Definition window under eReminders, check Exclude when sending. Patient doesn't want to receive automated eReminders at all. Set the Confirmed status for all appointments to a status that won't send. Patient has multiple scheduled appointments on the same day (e.g. one with hygienist followed by one with the doctor). Set the Confirmed status of the later appointment to a status that won't send.